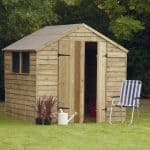 This traditional looking storage shed is an ideal choice for your gardening essentials. With sturdy, thick Shiplap walls, it is water tight, durable and makes a stylish addition to any garden. One thing you will notice from the picture however is the door is a little on the small side. So you may need to duck down in order to enter the shed. This isn’t a massive issue, but it does make it a little more inconvenient to use if you’re on the taller side. Like so many models in the Shed-Plus range, this one also utilises solid sheet flooring. So it isn’t really designed to hold anything of significant weight. You can add extra strength to the floor if this is a problem however. Three styrene windows are located on the side of the shed and you get to choose which side they are installed on. These filter a lot of light into the building, reducing the need to add your own light source. The timber has been dip treated so it also benefits from more water resistance than an untreated building. You do need to continue treatments however to maintain the claddings natural weatherproof qualities. Do that and you’ll qualify for the 10 year anti-rot warranty provided. The single door has a shorter than average design so if you are tall, you will need to duck each time you want to get into the building. It isn’t a huge disadvantage but it is still worth keeping in mind. Solid sheet floors aren’t the sturdiest and may not accommodate very heavy equipment. 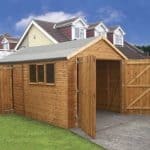 This traditional apex storage shed is part of the Shed Plus collection, known for its high quality designs. 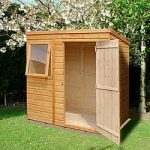 Featuring an exemplary height, you may need to duck to enter the shed if you are taller than 5’6”, but once inside you are spoilt with head space. It also has a generous width and depth, allowing you to store a wide variety of equipment. The door width is standard, but still provides a spacious entry point. The apex roof gives this shed a more traditional style. It is by far the most popular roof type used by manufacturers and it isn’t hard to see why. One of its main benefits is water resistance. Due to the sharp diagonal design, rainwater will never be allowed to collect on top of the roof. Instead it runs down the sides of the roof, onto the ground. This is largely what helps to give the building its fantastic 10 year anti-rot guarantee. We can’t hide our disappointment at the solid sheet floor however. 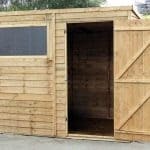 Though it is common to find this material used in sheds of this price, it does prevent you from storing certain types of equipment. Anything heavy could cause damage to the floor. It is worth mentioning that you can add another wooden sheet on top, though Shed Store don’t provide additional sheets of wood so you will have to buy them separately. Tongue and groove Shiplap cladding gives the shed a flawless, professional finish. If you run your hands across it you can feel just how smooth it really is in comparison to overlap. It has a much more polished design, but it isn’t just the cladding’s looks which make it so popular. At 12mm thick, it is much stronger and therefore longer lasting than other cladding styles. It also comes with an incredible natural water resistant finish. Even without treatment, Shiplap has a unique natural barrier against the rain due to the groove built in-between each panel. FSC European Softwood is used for the 28mmx28mm framing. Shed Store have pre-dipped the shed’s timber in treatment before they ship it out. They do however state that treatment needs to be done again after assembly and then continually every year after that. The door included on the shed doesn’t really have any stand out features. At 2’2” wide and 5’6” tall, it has standard measurements that are found on the majority of sheds. It also isn’t braced, though it does come supplied with a pad bolt which means you can padlock it if you buy one. It also comes with a standard 2 hinged design. Whilst these hinges do help to offer some stability, the fact it isn’t braced does leave it vulnerable to sagging with heavy use. Three styrene glazed windows form the main design feature of this shed. They are all located next to one another on the side of the shed. Styrene is shatterproof and is therefore a much safer alternative to glass. Another benefit of these windows is that they can be installed as shown on the picture, or on the opposite side of the building. The interchangeable sides give you more customisation which is always a benefit. Though a pad bolt makes the door lockable, you do need to buy a padlock separately. So as the shed is sold, it doesn’t actually come with much security. The styrene glazing is a little more difficult to break so technically this adds to the security of the shed. However, it is definitely advisable to add a padlock like the security alarm version offered as an extra with this building. Privacy is initially a problem as the shed comes with three fairly big windows. However, if you add a blind or curtains to the shed this will remedy the problem and even give the building a little more character too. There are quite a few useful extras available with this shed. For example, the security extras are definitely worth buying. The doors are pad-lockable, but they don’t actually come with a padlock. So we’d highly recommend the security alarm padlock on offer. Supplied with three keys, this is one of the strongest padlocks available and it comes with the additional benefit of an alarm. If somebody does attempt to pick the lock, an alarm will sound. This alarm is triggered by both vibrations and movement. Therefore until movement and vibrations cease, the alarm will continue to sound. The Wooden DIY Base Kit is also a good choice if you do not have a concrete or paving slab base to install the shed. However, if you plan on disposing of the floor and using the base for heavyweight storage, you will need a concrete base. What makes this base so special is that it can be used straight away. There are ground spikes to secure it into the floor, making sure it doesn’t move. Need light in the shed? Trying to find what you’re looking for in the dark isn’t much fun. So you may want to invest in the great solar light offered. This incredible little light is super-bright thanks to the six LED bulbs. These are powered remotely via a solar panel that uses renewable, free energy. It doesn’t need to be fitted into the mains and is so much cheaper than a mains operated electrical pack. Last but not least you can also choose from two different treatments. It is recommended that you treat the shed after construction so it makes sense to buy one before you check out. There is a Harvest Gold or Dark Brown colour to choose from; both of which will leave a very attractive and professional looking finish. If it wasn’t for the weak solid sheet materials inside the shed, it would have received a much higher score. However, despite that it is a great quality building with a good number of benefits. From the outside, the shed has outstanding protection against the elements. With annual treatment, it is guaranteed to last for a minimum of 10 years. The interior isn’t as durable however, though this can be improved as highlighted in the review. As you can add shelving inside the shed, its storage potential is pretty good. It should suit most people’s outdoor storage needs, though remember to upgrade the floor if you are storing heavy machinery or equipment. 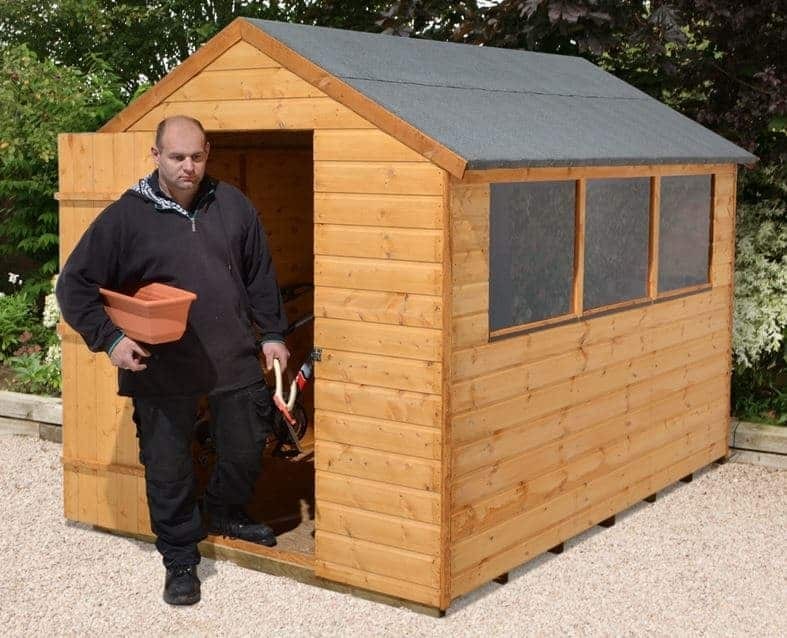 According to Shed Store, this model should take anything from 2-4 hours to erect. All instructions and fittings are included. At this price bracket we’d expect to see a stronger floor included and it also would have been nice to see a padlock added too. However, overall it still offers good value for the price you pay. Final Thoughts: If you’re searching for a high quality storage shed that won’t break the bank, this is a good option. Its three styrene glazed windows add to its aesthetic design, whilst ensuring a great amount of light enters the shed. This makes it really easy to find whatever you need during the day. As it is manufactured out of 12mm Shiplap tongue and groove cladding, you can also rest assured that it will withstand harsh weather conditions. A pad bolt on the single door helps protect it during high winds and also makes the building lockable. 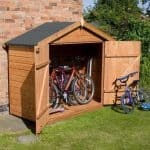 You do need to buy a padlock, but Shed Store do offer some pretty fantastic ones to choose from. 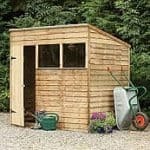 All in all it is an excellent quality, great value for money shed that is guaranteed to last for years.